are remarkable! 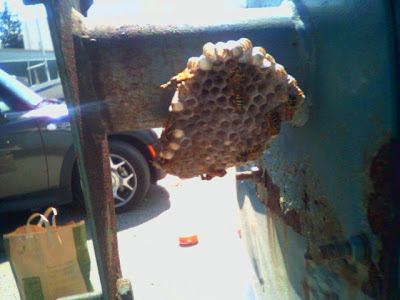 After a blast of 14 ounces of RAID Wasp and Hornet Killer on Saturday (delivered with precision from at least 14 feet away) I arrived today to see that, while many of them perished in the bombing, many had somehow made it through my "Shock and Awe"-style attack. So after applying a coat of wax to Big Blue (It's going to need at least 1 more), I went back to Target, armed myself with 2 more cans (28 more ounces! ), and in a Quentin Tarantino-style move, took both bottles to them at once. I also noticed that they had taken an interest in the pop-top since the bombing, so while keeping a keen eye out for the little killers, I aimed at both the remaining next on the spare tire mount, and the front of the camper top. Other than the continued wasp killing, not much happened on Big Blue today. 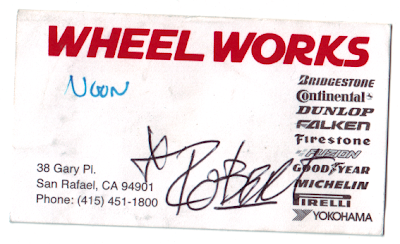 I did get Wheel Work in San Rafael to take the old crappy tires (a blend of name brands) off the wheels to prep them for painting. Only when I got home did I realize that the valve stems were still on (and they were made in Germany - could they have lasted 39 years? ), so I had to sit out on the deck of the houseboat and hack away at them with a hammer and a pair of pliers. Wow! I think that thing might have been there for 39 years too! I'll bet they are the original valve stems. I am the previous owner of BIGBLU3. I had no idea that would be a blog for the bus. I would have kept more stuff for the archives. Anyway, photos to follow when I get my stuff out of storage. keep your eye out when replacing those windows. this bus is not a westphalia but rather a US aftermarket one. thus, the existing windows are integral to the interior window frame design. which I think was way better than the wesphalia version. the poptop was a conversion from santa cruz. Monty - thanks for the heads up on the window, I'll do more research before I do anything. AND - they did appear to be the original valve stems as they had German markings on them. I though maybe you had been a purist and replaced them with OEM stuff.